Exciting news! We LOVE our new home, we hope you will too. We are now located in the Spirit Valley Mall (near the old Kmart, in between Cost Cutters and Soul Sisters). We now have a parking lot with lights and no meters! No need to drive around to find a parking spot to come see us anymore. We would like to take a moment and introduce you to our team. Some you may know, others are new. We are one big, crazy family. John Ludwig - Tax Professional - John is our newest tax professional. He comes to us with nine years of tax experience and is an AFSP (annual filing season participant). John has taken on the challenge of learning bookkeeping and is working with some of our newer clients. John is a tax geek and is available for any and all tax questions, BRING THEM ON! Sheri Murray - Office Manager – Sheri keeps the office running and handles a list of bookkeeping clients; however, she is always available for questions. She is still our go-to girl to get things done (and keep Deni on task). Skye - Office Manager in Training - Skye is Sheri’s daughter and comes in occasionally to do random tasks around the office. DJ (Diane Johnson) - Tax Professional - DJ works with our drop off and mail-in returns. She has branched out and has started working on bookkeeping for some of our smaller clients. Crystal Loree - Tax Professional - Crystal not only does tax returns she also does bookkeeping for many of our clients. She teaches QuickBooks to small businesses and is a Notary. Robin Friermood - Payroll Specialist - Robin is in charge of our payroll department. This includes payroll processing, W-2’s, 1099’s, and workers comp audits. Visit our website www.serenityduluth.com, we have recently updated the site to better serve you! You can request a tax appointment or tax organizer on our website as well as see all the other services that we offer. Of course, you can always call us. In December 2017 there was a major tax law change. Over the course of 2018, we received clarifications and training on this law and how it affects you, our clients. In order to alleviate some anxiety that you might be experiencing, we have made a list of the most common changes that our clients may see. This is only a partial list of changes to the tax code. There are many more changes that are not as common and therefore not listed. Please feel free to contact us for any individual questions you may have. There is no longer a 1040-EZ or 1040-A form. Everyone will file a 1040 form. The 1040 form has a changed look. The more complex your return, the more schedules you will file to accompany the redesigned 1040. New schedules have been added to facilitate the differing complexities of all individuals. With the increased standard deduction, some itemized deductions are eliminated, most notably, work expenses. Health insurance has NOT changed. There has been much confusion on this. If you did not have qualifying insurance at any time in 2018 you will be assessed a penalty. ****Going forward, starting in 2019, the requirement for health insurance remains but there is not an assessed penalty for not having it. You may have noticed a change in your take home pay on your paycheck. This is due to the new tax rates and brackets. Hopefully you have addressed your paycheck withholdings sometime in 2018. There is a checkup tool at IRS.gov. There have been changes to thresholds and income ranges that are far too numerous to mention. Please feel free to contact us on the ones that you feel affect you or check out our website blog. For our clients that have a small business (Schedule C), farm (Sch F), rentals (Sch E) or K-1’s, there is potentially a huge change. You may be eligible for QBI—basically 20% deduction from profits—that is before your expenses. For the business clients, the expensing rules have changed, allowing more write offs rather than capitalizing (depreciating). Minnesota did not adopt the Federal changes. As a result, more forms will need to be filed. Credits and deductions that were eliminated from the Federal forms might be able to be taken on your Minnesota return. Simply put, if your individual situation did not change much from last year, your Minnesota Tax Return should be very similar to 2017. For our Wisconsin clients—Your 2018 return will encounter a mixed effect. Some items changed with the Federal legislation, some they decided not to follow. Like Minnesota, you will need more forms to file to get to the results you had on 2017 return. For Minnesota residents who have children in school from K-12, there is the MN Education Credit and Subtraction. You will need to have receipts for your school expenses in order to claim this credit or subtraction. There is still no reciprocity for Minnesota and Wisconsin. For those of you that this affects, we will still have to file two state returns. The annual gift exclusion if $15,000. The IRS has expanded requirements to include due diligence for Head of Household filing status. As preparers, more questions will have to be asked to substantiate the Head of Household filing status. Alimony payments beginning with new divorces in 2019, are no longer deductible and not taxable to the recipient. With all the changes being made to the Federal and State tax laws, we have attended many seminars to better understand the nuances of these changes. We are here to serve you in the best way possible. Please feel free to contact us with any questions you may encounter, and we will see you at your tax appointment! Side note, if you receive the Earned Income Credit (EIC) or the Additional Child Tax Credit (ACTC), the IRS will NOT release refunds until after February 15th, the IRS cautions that the refunds won’t arrive in your bank accounts (if direct deposited) until the week of February 27th, at the earliest. For tax year 2018 and forward; in order to protect your identity, the IRS is requiring you to provide identification such as your driver’s license for you and your spouse (if married). We will need to see the Social Security card for all members on your tax return. This is so that the IRS can help prevent identity theft. This will be required of all our new tax clients. If we don’t already have copies of your information in the file, we will request it. Please have your documentation available at your appointment. Beginning January 28th, our office hours will be 8:30am to 8pm Monday through Thursday and 8:30am to 5pm on Friday and Saturday. We have many day and evening appointments available. The first appointments will start at 9am and the last appointments will be at 7pm Monday-Thursday. Friday and Saturday appointments will start at 10am, the last appointments will be at 4pm. You can also drop off, US Mail, or email your tax information to us as well. This year, we would like to touch base with everybody. Even if you mail or drop off your tax information, we will be setting an appointment for a phone conference, at your convenience. Please allow 30 – 60 minutes for this call, we want to make sure that we are getting all of the necessary information. In addition to our tax prep services, we offer full-service bookkeeping and full-service payroll. Give us a call if you or someone you know is interested or in need of our other services! We also prepare small S-Corp, Partnership and Non-Profit tax returns. Business taxes have changed as well, and we are also looking at how this affects you as the taxpayers. The deadline for filing these tax returns is March 15th, 2019. A six-month extension can be filed -- the final deadline to get the tax return completed is September 16th, 2019. The deadline to file and pay your personal taxes is April 15th, 2019. You can file for an extension however; your tax payments are still due April 15th, 2019. If payment is made after this date, a late fee will be assessed. The final deadline, after filing the six-month extension, is October 15th, 2019. Unfortunately, with all the tax law changes our prices needed to change as well. Our base price will now be $140 (up from $125) this includes your federal return, one state and e-filing. This price does not include any additional forms that you may need, such as; Schedule A (Itemizing), Schedule D (Stock Sales), Schedule C (Business) and others. We realize that tax time can be stressful for everyone. We will do our very best to help keep your cost as low as possible. If you compare our prices with others in our local market, you will find that not only are we competitively priced, but the peace of mind you get from our team is invaluable. We are looking forward to seeing you all and we wish everybody a great holiday season! We give thanks for this past year for our families, clients and friends. We will be closed on Thursday November 22 and Friday November 23. Reminder for payroll processing we will need your information by Monday November 19th by 5 pm. Thank you all for a great year and may your holidays be filled with much gratitude for all the work you do all year long. While the boss was away at training, Jackolyn the Jack-o-Lantern your payroll specialist & Llerleen the Llama your bookkeeping wizard were here holding down the fort. 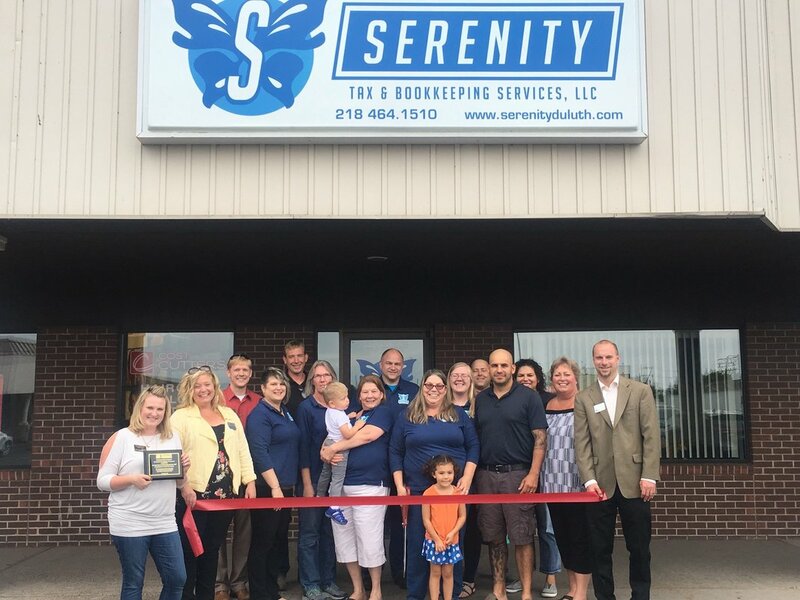 September 18 · Last Friday, we join the team at Serenity Tax & Bookkeeping Services, LLC to celebrate their new location at 215 N. Central Avenue, Suite 9. 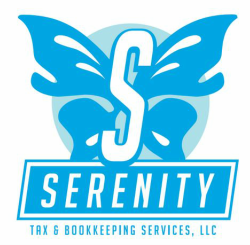 Serenity Tax & Bookkeeping Services offers a number of different financial services from tax preparation, payroll, bookkeeping and other services. To learn more about Serenity and the services that they provide, visit serenityduluth.com. We boxed it all up and moved down to West Duluth. 215 N Central Ave Ste 9, Duluth MN 55807. "You know where the old Kmart used to be", we are in that shopping center. Larger space, everyone has their own offices. We offer an art gallery of some our clients works. Check out our facebook for photos.